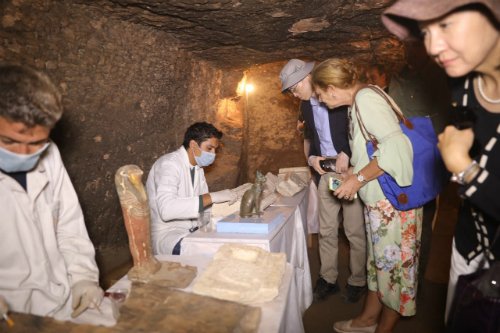 Minister of Antiquities Khaled El-Enany announced on Saturday a new discovery made by an Egyptian archaeological mission during excavation work carried out since April at the area located on the stony edge of King Userkaf pyramid complex in the Saqqara Necropolis. 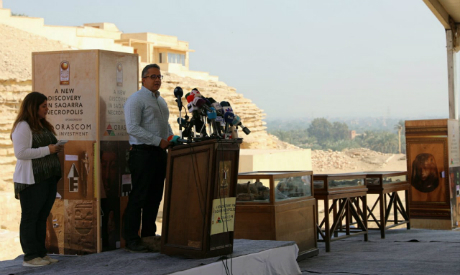 Cairo governor Ahmed Rashid attended the announcement, along with members of parliament and 30 ambassadors from all over the globe to highlight the role that antiquities play in promoting the country and its unique heritage. El-Enany explained that the mission uncovered three plain New Kingdom tombs that had been used during the Late Period as a cat necropolis, along with four other Old Kingdom tombs, the most important of which belongs to Khufu-Imhat, the overseer of the buildings in the royal palace. This tomb can be dated to the late fifth and the early sixth dynasties. He also pointed out that the Egyptian mission selected the site to excavate because there was a high probability that a collection of Old Kingdom tombs could be uncovered around the ramp of King Userkaf pyramid complex. In 2008, the mission stopped digging and instead devoted all of its work to the studying, documenting and restoration of some of the discovered tombs, though all projects completely stopped after 2013. 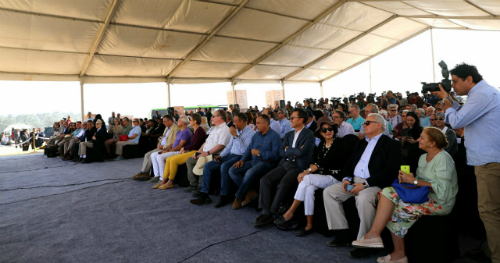 “This will be the first of three upcoming new discoveries in other governorates in Egypt to be announced before the end of 2018,” said El-Enany. 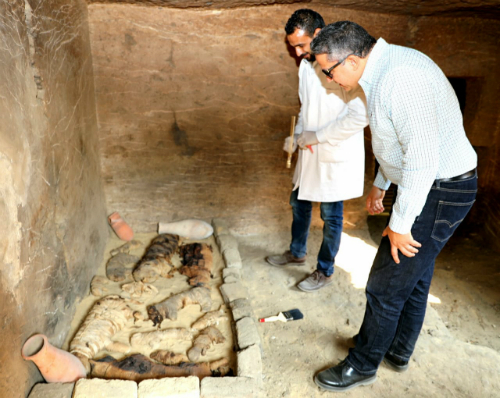 Mostafa Waziri, the Secretary-General of the Supreme Council of Antiquities, announced that the Egyptian mission succeeded in unearthing the first ever scarab mummies in the Memphis necropolis, as two large mummies of scarabs were found inside a rectangular limestone sarcophagus with a vaulted lid decorated with three scarabs painted in black. Studies on these scarabs show that they are wrapped in linen and in a very good preservation condition. Another collection of scarab mummies was also found inside a smaller and squared limestone sarcophagus decorated with one painted black scarab. Tens of cat mummies were also unearthed, along with 100 wooden statues of cats and a bronze one dedicated to the cat goddess Bastet. A collection of wooden gilded statues depicting the physical features of a lion, a cow, and a falcon was also unearthed. 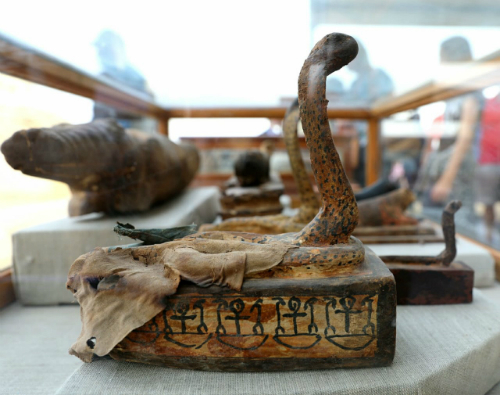 Painted wooden sarcophagi of cobras with mummies found inside them were also discovered along with two wooden sarcophagi of crocodiles. 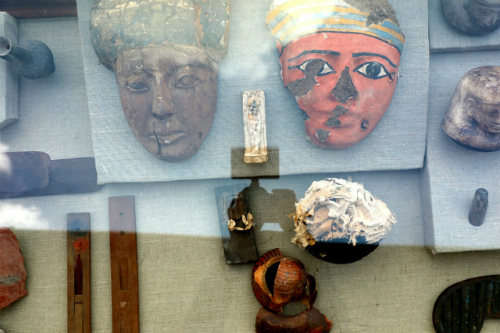 Within the debris, the mission succeeded to unearth around 1000 amulets made of faience dedicated to different deities, including Tawesert, Apis, Anubis, Djehuty, Horus, Isis, Ptah Patek, and Khnum, as well as other faience amulets in the shape of the Udjat eye, the white and red crowns, and the Wadjat column. Three alabaster canopic jars and writing tools, such as ink pots with pens, were found along with several papyri featuring chapters from the Book of the Dead. Names of two ladies, Subek Sekt and Mafy, were also found engraved on a false door for the first time ever. Sabri Farag, the Director General of the Saqqara Necropolis, said that a collection of baskets and ropes made of papyrus was also found along with 30 clay pots, a headrest, and alabaster and bronze jars inside a wooden sarcophagus. A large number of decorated stone reliefs and blocks, along with parts of false doors, were also found with two blocks representing a part of the lintel of the tomb of Ankh Mahur, one of the Old Kingdom viziers. Orascom Investment Holding (OIH) is the sponsor of the event, in accordance with the newly launched commercial sponsorship regulation, according to the request it submitted to the ministry of antiquities. Engineer Naguib Sawiris, the Executive Chairman of OIH, affirmed the company’s interest to develop archaeological sites to show the exceptional richness of Egyptian civilization and to attract the attention of the world towards its magnificent monuments and great civilization so that it becomes the focus of the world. Among the attendees are ambassadors of Morocco, Jordan, Kuwait, Cyprus, Mexico, Italy, Malta, Hungary, France, Ireland, Armenia, South Korea, Tajikistan, Japan, Austria, and Bella Russia. Saudi Arabia and Georgia’s vice-ambassadors have also attended, as well as Denmark’s general councilor and the cultural attachés of the Czech Republic, Georgia and USA. The heads of the American Research Centre in Cairo and UNESCO were also among the attendees. 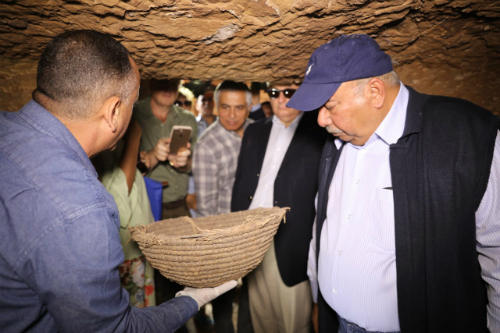 Multiple ambassadors have participated in several archaeological events over the last month, including the Abu Simbel Temple solar alignment phenomenon and tours around the archaeological sites in the New Valley and Saint Catherine in South Sinai.